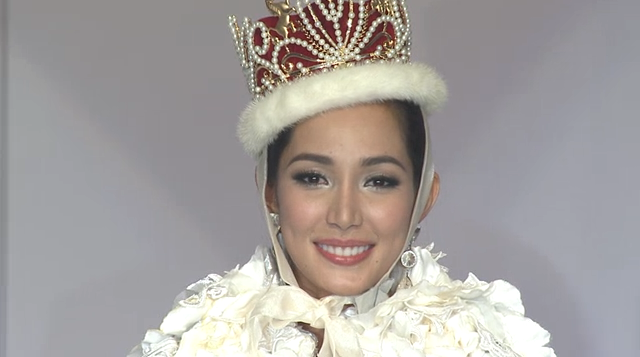 23 year old Miss Philippines Bea Rose Santiago from Masbate City took home the crown during the conclusion of the the 53rd Miss International pageant, held at the Shinagawa Prince Hotel Hall in Tokyo, Japan on December 17, 2013. Miss International 2008 Alejandra Andreu from Spain crowned Bea Rose, who bested 66 other delegates from around the world. She impressed the judges during the speech portion where she said she wants to “sustain the spirit of sympathy and hope”. Before Santiago left for Japan, she told the press that she is dedicating the competition to the survivors of typhoon Yolanda. She dedicated her victory to the survivors of typhoon Yolanda. Last year’s Miss International, Ikumi Yoshimatsu of Japan, was not allowed to attend the finals due to her involvement in a media scandal which includes harassment accusations to powerful people in the business. She was not able to crown her successor. The 1st runner-up was Miss Netherlands (Nathalie Den Dekker) and the 2nd runner-up was Miss New Zealand (Casey Radley). Colombia and Hungary completed the Top 5. Contestants from Brazil, Ecuador, Gibraltar, Iceland, Lithuania, Russia, Puerto Rico, Spain, Thailand and USA were part of the Top 15 semi-finalists. Not a single African delegate reached the semi-finals. New Zealand won Miss Friendship, Macau was awarded Miss Internet, Lithuania was elected Miss Photogenic and Aruba walked away with the award for Best National Costume. This was the second international crown for the Binibining Pilipinas Gold (50th anniversary) class. Mutya Datul won the Miss Supranational competition in Belarus last September, while Ariella Arida was 3rd runner-up in Miss Universe. The country also won the Miss World crown with Megan Young. 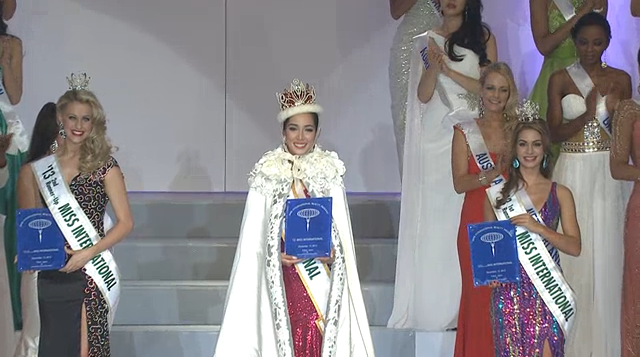 It is also the 5th Miss International crown for the Philippines.